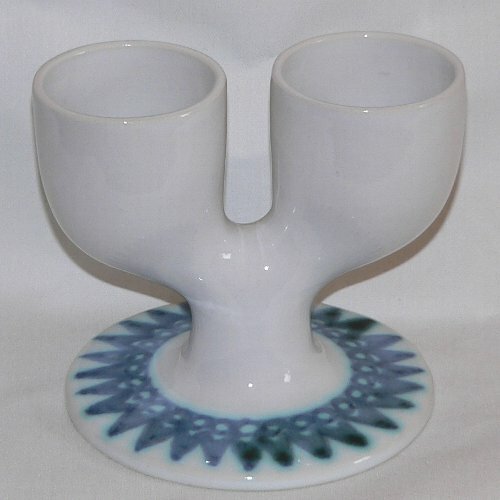 Early Troika St Ives double egg cup in a smooth white glaze with fantastic blue aztec style pattern around the base of the egg cups. This Troika egg cup measures approximately 9cm tall and 10½cm wide. On its base this Troika egg cup has the black printed Troika St Ives England stamped pottery mark. 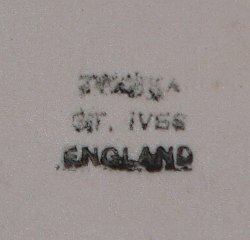 This pottery mark was used by the Troika pottery from c1964 until 1970, whilst it was based in St Ives, Cornwall, England.